Paywall going up before Christmas with iPhone release. The left-leaning broadsheet says the new iPad app is currently in development and is "aiming high and hoping to steal a march on news-oriented apps already available." The new iPhone app, which is going to cost £3.99 for a year's subscription or £2.99 for six months, will replace the existing offering from The Guardian and will serve up award winning video content and a landscape reading option. As well as the aforementioned live football scores service, there'll be acess to reader comments as well as faster access to blogs. The Guardian is aiming for a pre-Christmas release for the iPhone app with no news on when the exciting iPad app will arrive. 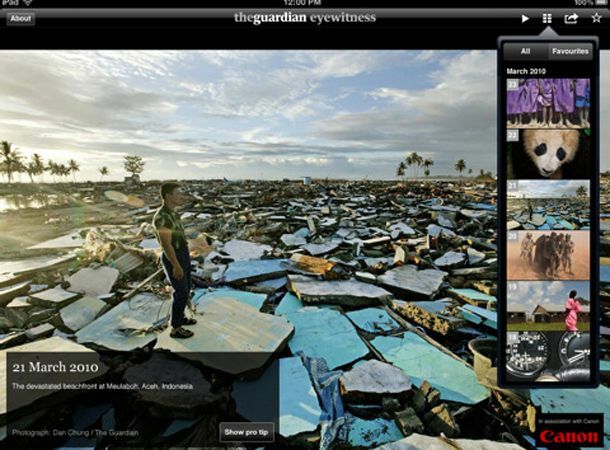 The Guardian Eyewitness app for the Apple tablet has already been a big success.